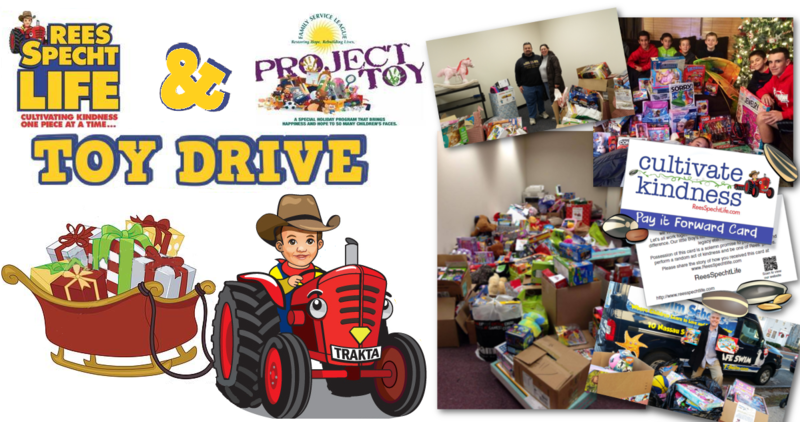 Please consider supporting our 2016 Toy Drive! 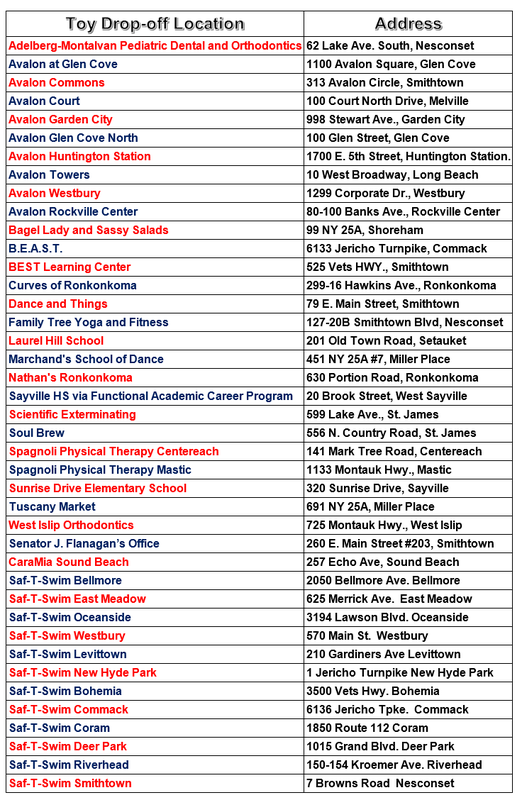 This year we have over 40 drop-off locations in Nassau and Suffolk Counties. Over the past four years, the ReesSpecht Life Foundation has collected over 10,000 toys for family’s in need. We hope to make this year our most successful ever. We cannot do it without your help. Please refer to the list below for drop-off locations and addresses. Drive runs from now until December 12th. Thank you! The ReesSpecht Life Foundation is running a short fundraiser to help us raise the funds to grow our programs and continue spreading the seeds of kindness world-wide. We believe in the power of kindness to change the world for the better. This past year has seen a great divide form in our country and it is our goal to remind us all that kindness is the greatest single factor that unites US ALL together. 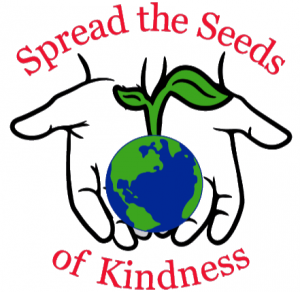 We are offering these limited time “Spread the Seeds of Kindness” T-shirts and hoodies from now until December 4th only. ALL proceeds from the sale will go to our charitable endeavors. To view the items for sale, head over to www.booster.com/cultivate-kindness and buy a shirt. It’s that simple. Every shirt we sell helps us to plant the seeds of kindness. Stop wishing for a better world and let us help make it happen, one Rees’ piece at a time. This election brought out the worst in all of us and now it is (effectively) over. Half of the country is celebrating and the other half is full of apprehension and fear. As I write this my Facebook feed is blowing up with many of my friends and family lamenting the coming apocalypse. I for one am actually relieved. I tend to get worked up in the short term and then calm down and collect my thoughts and get right back to solving problems. Soon after Rees died I started to think about his loss, and its effect on me, and began to look at it as a problem that needed solving. Life threw one of the worst experiences it could at me. I recognized that this terrible negative could only be countered by a positive of equal magnitude. The darkness of the void Rees’ passing created seemed limitless; requiring a commensurate power to illuminate it. I found that power. It is kindness. If it weren’t for Rees’ death, I don’t think I would have ever had the perspective I do now about just how powerful kindness is. Seeing it’s power, in contrast to the devastation I felt, gave me hope where none existed before. It turns out that hope is the key. Hope is the dividing line between darkness’ Yin and light’s Yang. Hope is what got me through the worst time of my life – and if you let it in, it will help you get past the feelings you may have right now. RICH SPECHT is a father of four who holds a bachelor’s degree in biology from the University of Mary Washington and a master’s degree in liberal studies from Stony Brook University. Prior to embarking on his career as a public speaker and advocate for kindness, Rich was a science teacher for 15 years at Great Hollow Middle School, in Nesconset, New York. In addition to his speaking, Rich is also the published author of the award winning children’s book A Little Rees Specht Cultivates Kindness. Rich and his wife, Samantha, are the co-founders of the ReesSpecht Life Foundation which they formed in the wake of the loss of their only son, Richard Edwin-Ehmer (Rees) Specht at 22 months old. The acts of kindness that the family received after Rees’ passing inspired them to “pay forward” that kindness; which the foundation does in the form of scholarships for High School seniors who demonstrate a commitment to their community, compassion and respect, as well as the distribution of almost four hundred thousand ReesSpecht Life “pay it forward” cards. The themes and characters from Rich’s book(s) are currently slated to become an animated children’s television series. 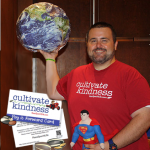 The book and television adaptations of A Little Rees Specht Cultivates Kindness represents the culmination of Rich’s goal to help make this world a little better, one Rees’ piece at a time. Rich currently resides in Sound Beach, New York with his wife, Samantha, daughters, Abigail, Lorilei and Melina as well as his angel above, Rees. Thankfully, mercifully, the U.S. election season ends this coming Tuesday, November 8th. I am almost certain that I speak for most of us that the date can’t arrive soon enough. It seems like post after post on social media is about the election. Friends share stories with me about people judging them based on their political choice. Compared to four years ago things appear much worse now and the polarization seems ready to go nuclear. Of all the complaints that pop up on my social media accounts, the idea these candidates were “forced upon us” appears most frequently. To these people, the unpalatable choice of either candidate proves how broken the system is. I couldn’t disagree more… Contrary to popular belief, the system is working exactly as intended. In fact, I truly believe, the system is working perfectly. Our founding fathers provided, within the framework of the constitution, a dynamic system that could adapt to an ever-changing society. The beauty of our system is that it provides the opportunity, if we wish, of basically hitting the reset button every four years. In theory, the nomination process should allow for people with similar viewpoints to choose a candidate that best represents them. This candidate then runs against the choice of the group with disparate views and the electorate then gets the chance to choose the best of the best. You call these two choices the best of the best? The key here is this is the theory behind our election process, but is not how it works in practice. In practice, only about twenty five percent of voting eligible Americans participate in the presidential primaries. A full three quarters of us don’t participate in the process at all. The majority of Americans abdicate their power of choice to someone else. We make the mistake of thinking that someone else will make the choice for us. They are figuratively saying, “Wake me up when it’s time to elect a president”. Therein lies the real problem. The truth is that 75% of the people complaining about how deplorable Trump is and how corrupt Hillary is never made their voice heard in the first place! Three quarters of us declined our chance to participate in the first place, yet we are now collectively complaining about the result of our apathy. The enemy here isn’t Hillary or Donald. The real enemy is our apathy. 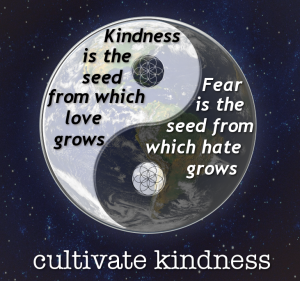 ReesSpecht Life and its “Cultivate Kindness” message started in the midst of the 2012 elections. November 3rd, 2012, one week after the tragic drowning of my son Rees, found me addressing the throng of people at his memorial. I posed a simple request: Focus on that which brings us together – not what divides us. In the days leading up to Rees’ death I too was a part of the chorus of discontent that permeated everything at the time. The kindness we received in the wake of his death opened my eyes up to its inherent power. I learned, the hard way, the error of focusing on our differences. As I spoke, I vividly recall seeing heads nod in agreement. Kindness, I said, was the one thing we could all agree on. Our focus should be on lending a helping hand, raising each other up, not putting those who dissent down. Everyone in attendance agreed, not because of some duty to assuage a grieving father, but because those words were truth. Those words are just as true today as they were four years ago. Sadly, when I look at my newsfeed, I see what I saw then, only it’s even more pervasive now. People see an existential threat to their being in the candidate they oppose. All i hear is why one candidate is “the worst” and how voting for them is tantamount to willfully choosing to initiate the apocalypse. Each of us is to blame. We each carry a piece of guilt for the ultimate transgression: Apathy. The sad reality is that people are not as invested in our political system as they should be. I hear excuses all the time as to why, but let’s be honest… Those answers are lies our brains tell us to make us feel better about the truth our apathy spawns. Statistically, the majority of you reading this are more invested in; a) Your favorite sports team b) Your favorite reality TV show c) Celebrity gossip d) A hobby e) all of the above. If you are, this isn’t a condemnation – it’s an affirmation of the truth. The real reason we are stuck with the choice between Mr. Rock and Mrs. Hardplace is because, collectively, we didn’t invest the time into doing the little things that would make the biggest difference today. Instead we chose the two candidates with name recognition, making the easy choice that allowed us to focus on what really matters – What Kim Kardashian is wearing today! 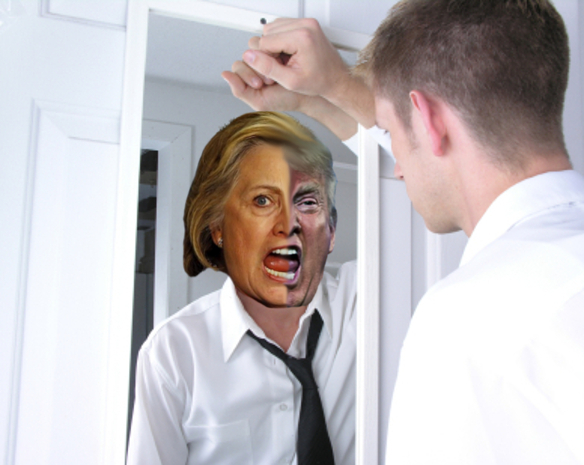 Trump and Clinton are our societal reflection in the mirror. It is no more possible to change the current state of this election than it is to instantly change your own reflection in the mirror. The greatest irony is that self-reflection is the first step to changing our reflection in the mirror. You must first identify the problem and then begin a plan to, incrementally and slowly, make the changes you need going forward. In other words, you have to do it piece by piece. One little piece at a time… It’s not a coincidence that those very words are in our motto. The one thing I truly understand now is that real, lasting, positive change does not happen in an instant. It takes time. It needs to be cultivated. You cannot grow seeds if, at the same time you are trying to nurture them, you throw garbage on top of them. If we want to make the world a better place, it has to start with us. If this election proves anything it’s that people are willing to shatter the mirror rather than look at the reflection anymore. I wrote those words the night of my little boy’s memorial. A night four days removed from the devastation of Super Storm Sandy. A night where I feared no one would show up, only to see the funeral home filled beyond capacity. My reflection of that night changed the course of my life and lives of countless others touched by the over 390,000 kindness cards distributed worldwide in Rees’ name. Prior to that moment I felt as you may now… That my world was beyond repair and all hope was lost. That all changed when I had the chance to reflect on the best the world has to offer and work to cultivate it.